Who am I, good question as I have had several thoughts as to the answer to that. Although I knew I always one really, I am a squirrel. Instead of hoarding nuts, I hoard what I consider to be useful craft bits, wool, beads, tools the list goes on. I am also a creative, I just like to give vent to my creative processes, even though some of my projects don’t always have a particular use, I love the activity of creating something. This last year I started searching the house and collecting the stashes of “useful items” together. Yes I have done a little de-clutter, well you have to make room for other treasures you start to find as you begin projects don’t you. Since starting this blog there have been quite a few changes to my life, normal for me I seem to have reinvented myself so many times. As I am no longer teaching and have become a full time carer for my precious hubby this year. I have become interested more liked obsessed with crafts. 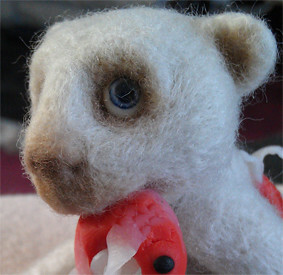 Especially using needle felting to sculpt little characters. Everyone who has seen the little critters has been pushing me forward to try to sell them. At first I couldn’t see who would be interested in buying these, and then there is the work involved even the simple ones take me between 10 and 20 hours to complete. As I am working each one starts to gain its characteristics, and takes on a story so to speak, how many times I have started with a specific idea in mind just to find it morphs as I start to detail the work, sometimes this is with the addition of accessories, be it a little hand knitted hat or handmade polymer accessories. But sometimes I can be working on say perhaps a bear, but once the eyes are in place and I start sculpting the details it can totally change, but that’s being a creative for you, just following the creative flow. Who knows what the future has in store, but I’m going to try and make the best of it. You got to try haven’t you! Obviously a lady of many talents.